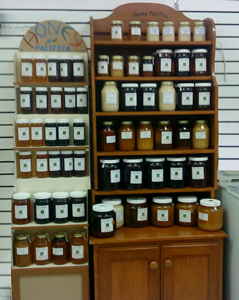 Sunrise Vitamins is now featuring Honey Pacifica's Cold Packed Honey products in two retail locations. Sunrise Vitamins is a wonderful store with a fine selection of natural skin care items, vitamins and organic foods. Cold Packed Honey Sizes: 1lb. 3 lb. 6 lb. and 12 lb Jars. Flower Varieties: Avocodo Honey, Brazilian Peppertree Honey, Buckwheat Honey, Creamy Wildflower Honey, Eucalyptus Honey, Orange Blossom Honey, Raspberry Honey, Sage Honey, and Southern California Wildflower Honey. Regular Raw Honey Sizes: 1 1/2lb. 3 lb. 6 lb. and 12 lb Bottles. Flower Varieties: Avocodo Honey, Buckwheat Honey, Eucalyptus Honey, Orange Blossom Honey, Sage Honey, and Southern California Wildflower Honey.